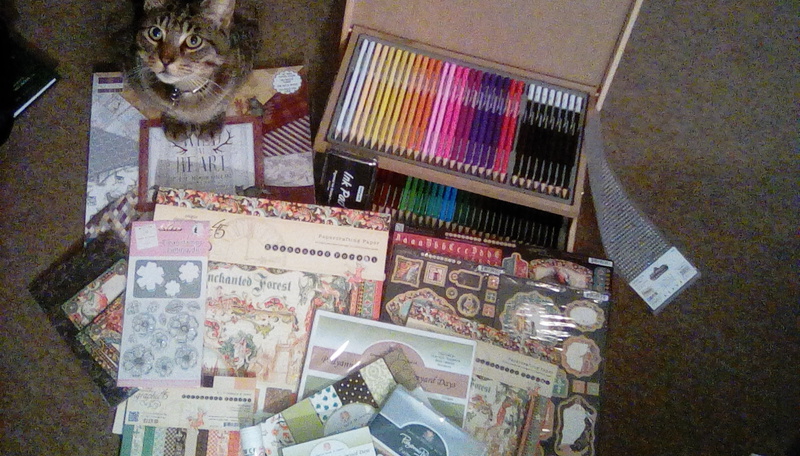 As I mentioned in a previous post, I was lucky enough to inherit a huge craft stash frtom a friend of my mother in law just before Christmas. Time constraints have meant I was only just able to make a thank you card for the donator, but having to wait meant one of my presents got its first outing. I don’t know the lady who gave me her stash at all (not even her name, have had to text mother in law to find out who to write it to! ), but I feel that the insights her stash gave me helped to make a slightly less impersonal card. 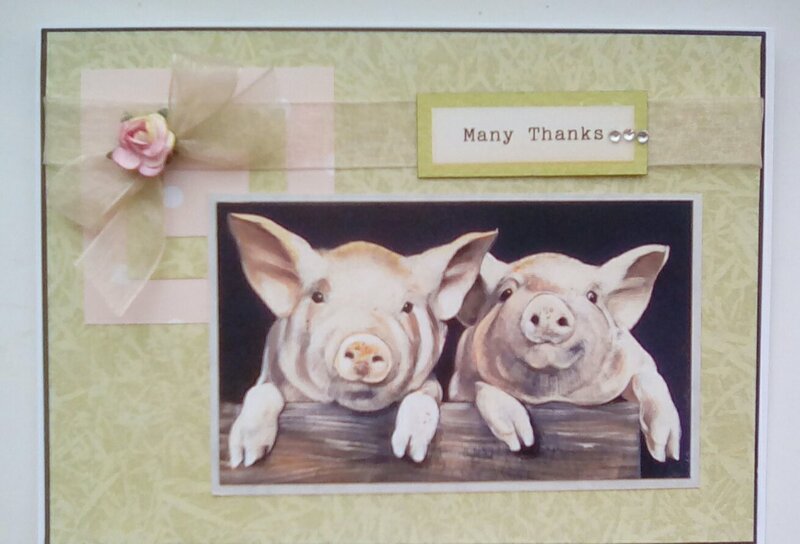 I received the Pollyanna Pickering Farmyard Days paper crafting kit from his Lordship for Christmas and I just love these piggies, they seem cheeky and friendly to me. The sentiment was from the same kit. The papers I used were all from my inherited stash, including thge matting layers. I sometimes like to use loads of layers and make a complex, layered creation, but I know this isn’t to all tastes (or very friendly on a post-December pocket when posting) so I chose to keep this very simple with only 2 patterned papers. The pattern on green paper reminded me of hay being strewn around, so seemed fitting for the main background for the piggies. I wanted something which contrasted, but gently, and which complemented the colours of the topper and this peachy dotty paper fit the bill well. In order to add a bit of interest, I decided to use 3 squares of papers in sizes decreasing by 2cm at a time so that each layer showed off the paper. I placed the topper towards the bottom right hand corner, keeping a roughly 1cm border as that was the border around each layer of squares and I like designs to hang together. The ribbon was also inherited. It’s a lovely champagne colour organza with a slight sheen. I wrapped it around the top of the card, approximately 1.5cm down. I added a bow, and when digging iin my new ribbon box I found wired roses and felt a rose centre for my bow girlified the card a little more. Finally, I added three little crystals to the end of the sentiment (it was the second try, apparently my cat likes the taste of the glue 😕) and stuck it to the ribbon. Fingers crossed the lovely lady likes pigs! This entry was posted in cards, craft on December 31, 2016 by Isn't She Crafty. His Lordship and I are both working December 25th this year – healthcare, like so many other professions, doesn’t shut down. Yesterday (23rd) was the last time we really see each other till the 28th, so it was Christmas! I admit I’ve been very influential (also known as bossy) in his purchases, but I am very excited by my pressies and can’t wait to start playing. As you can see, I’ve got willing assistant, too. I want to wish everyone a Happy Christmas and all the best for 2017. This entry was posted in Uncategorized on December 24, 2016 by Isn't She Crafty. I had a message yesterday from my mother in law. A friend of hers is giving up her crafting stash and I’ve been offered it. The lady in question has said for me to look through and choose what I’d like, then donate anything else to a charity. My immediate reaction was excitement. Free stash!!! And as some of you know, I’m crafting on thinner reserves than usual due to unfortunate placement of the Christmas tree, so having a whole new supply is amazing. Today, though, as I was searching for the fat quarters I bought and hardly used, I got to thinking. My own stash is one of my most personal things. It reflects the changes in my ability and style over time as well as fashions. It’s full of half done projects and those which i wasn’t happy with so put back to recycle. It shows off my OCD with meticulously labelled iitems and storage, but also my drawer of shame where I tidy to when time’s tight. My husband knows of very little of it; my crafting expenditure iis an area i stay shtum about. I do share crafting prodcts, but I would never set someone free on my strash, I’d pull out things for them to use or choose from, limit their exposure to my crazy and I’d definitely not allow my drawer of shame to be aired. I have no idea of the financial value of my stash, but it’s invaluable to me personally and I can’t imagine anyone rifling through it and passing judgement. So, I will accept my inheritance with a huge grin, but treat it with respect and I can see myself struggling to reject any for donation. Does anyone else feel the same emotional attachment to their stash? And how would you feel about inheriting a stranger’s stash? This entry was posted in Uncategorized and tagged craft stash on December 19, 2016 by Isn't She Crafty. When we put up our Christmas tree, I hadn’t thought of what I was blocking in, not to be seen till January, and I’ve managed to trap all my card blanks, my non-christmassy scrapbooking papers, my Big Shot and dies, my spare adhesives and most of my card stock! I am experiencing withdrawal symptoms (and I’ve tried, moving a decorated tree can’t happen 😤), but it’s making me look at kits I’ve had for ages and not touched, and the lovely paper its I tend to shy away for some reason, and use my Scan’N’Cut – to the poor cat’s disgust. One of the papercrafting kits I had was Papermania’s Victorian Christmas. The imagery is just gorgeous, traditional and muted colours, Santas who make you feel likes good child waiting for your stocking to be filled. I am not a huge fan of decoupage; I get frustrated when I can’t get a card in an envelope, but I aso usually prefer more simple, cleaner designs. 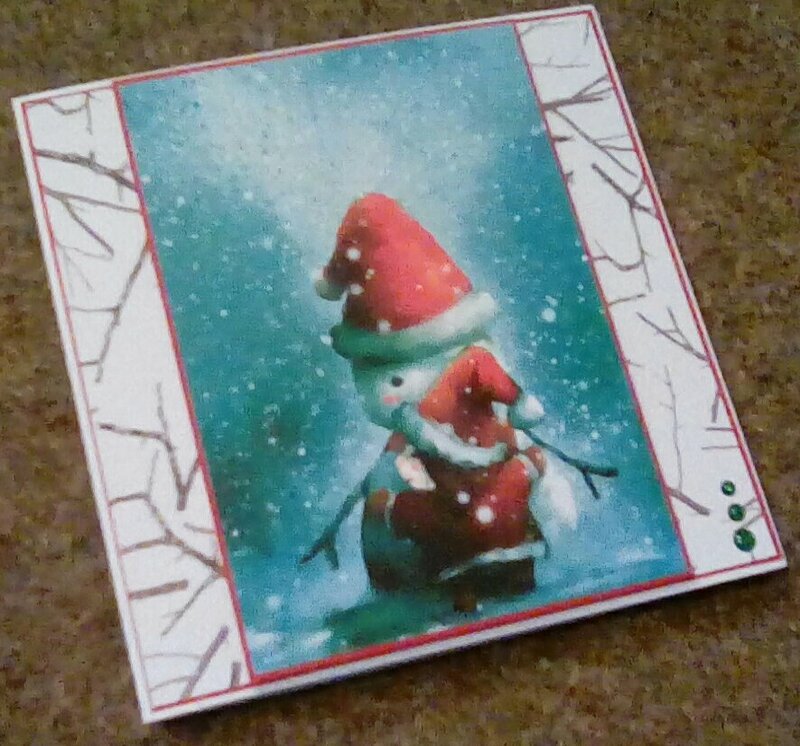 My Victorian Christmas collection contains an A4 decoupage pack, and it seemed a shame to waste it. As I said, my card blanks and cardstock are trapped. 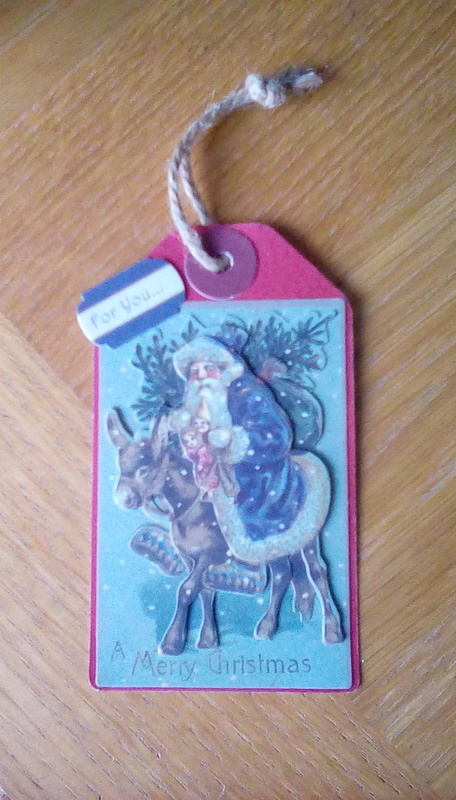 I’ve made several card fronts to stick on when I can, but I’ve been making gift tags from my decoupage pack. I’ve been a bit eager and already delivered a couple of gifts with them attached before I remembered I need photos, so only 2 to show. One way I use decoupage in a way which iis more me, less fiddly, is to build up the layers without 3d foam or silicone glue, and I have tosay it’s by far my favourite way. 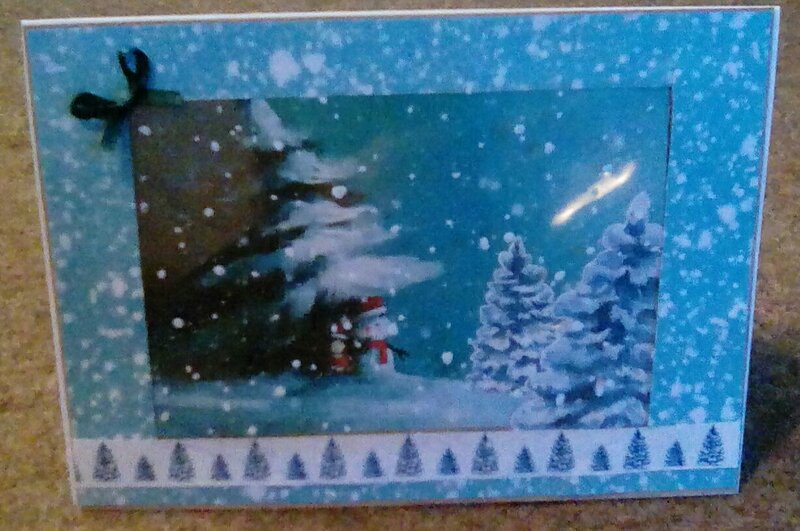 This entry was posted in Christmas, craft, decoupage on December 16, 2016 by Isn't She Crafty. In a previous most, I said I would do a more detailed write up of a card using the gorgeous Best Friends collection from December 2016’s Making Cards Magazine, and here it is. I love the images and didn’t feel that they needed much extra, so I decided to make a shaker card, meaning that all the attention will beon the lovely topper. Select and cut a topper from the Best Friends collection. I liked the little present, and I also wanted one with a larger more empty space to one side so I could use some trees from the collection. Cut a piece of a relatively plain background paper to 124x176mm and layer on a backing card of your choice (mine was just for strength so I haven’t listed it, but you can make a frame of it if you want). As I wanted to use my background paper as a frame, I cut an aperture to 2mm smaller than my topper, ensuring it was central. 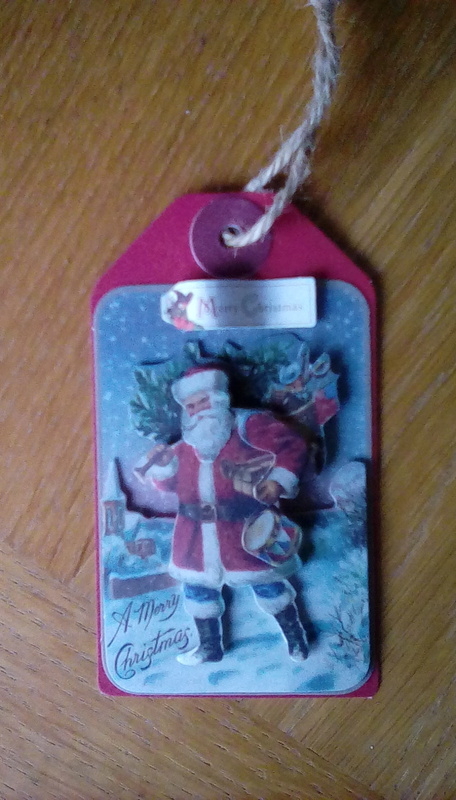 Attach the topper iin the centre of the card blank. Cut a piece of acetate around 100mm bigger than your aperture so you’ve got a good amount of border to stick. Fasten this to the rear of your aperture. I used red double sided tape because it’s very sticky and strong and I know I’ll not have any gaps. Surround your topper with 3d foam tape (or lots of little pads if that’s all you’ve got), making sure there’s no gaps big enough to lose your sequins through or for them to get stuck in. Put a selection of sequins over the topper. I find too many is daunting, less is more here. Wipe the inside of your acetate with the antistatic bag to stop sequins sticking to it, then fix your frame over your topper and give it a shake to enjoy yourhard work! Cut two trees from the Best Friends collection and stick these to aperture. the bottom left corner of the aperture. Finally, add any embellishments you want to the card. I had slightly scruffy corners to my aperture so chose to disguise tgese behind sequins matching the shakers, and I added some turquoise glitter randomly over the frame for some good old festive bling. If you want, now’s the time to add your greeting. 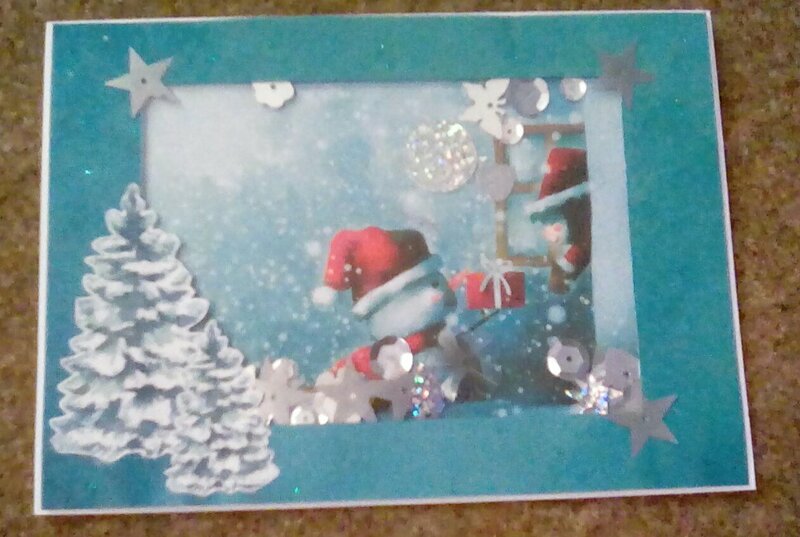 This entry was posted in cards, Christmas, craft and tagged making cards, paper craft on December 10, 2016 by Isn't She Crafty. When my copy of Making Cards Magazine (MCM for speed) drops through my door, I put the free papers to one side and read the magazine first, leaving the middle pages (ideas on how to use your free papers) till last. For some reason, I always read magazines back to front, so I read the introduction last! Only once I’ve read the whole thing and made a mental shopping list off everything I would love to buy from that issue do I allow myself to look at the free papers. I find myself looking through them several times, starting to plan projects and sometimes getting out my ribbon stash to match colours. The December issue arrived at the start of the month. I was so excited to find that my Pinterest board was highlighted! I like MCM as I get papers I’d not choose for myself, it forces me out of my comfort zone, especially when the designs are bright and modern, or very bold patterns. After my excited waving the magazine at His Lordship and being made a congratulatory cup of tea, I looked through the free papers. This month the two collections are All That Glitters and Best Friends. The first is a beautiful, elegant collection of blacks, whites, golds and pinks, the latter a very cute but also quite grown up collection based around a child and a snowman. I was really keen to get crafting, but I was waiting on my delivery from Create and Craft of Kanban mirri board (3 for 2 on a kilo of each!!!). I knew it would be the perfect compliment for the All That Glitters collection. I did let myself cut out the toppers, though. The Best Friends collection is more traditional in colour, reds, blues and greens. Now these colours I had on hand, so here’s some pictures (starting with the actual collection) of my cards so far… I’ll choose one and do a more detailed write up at a later date. 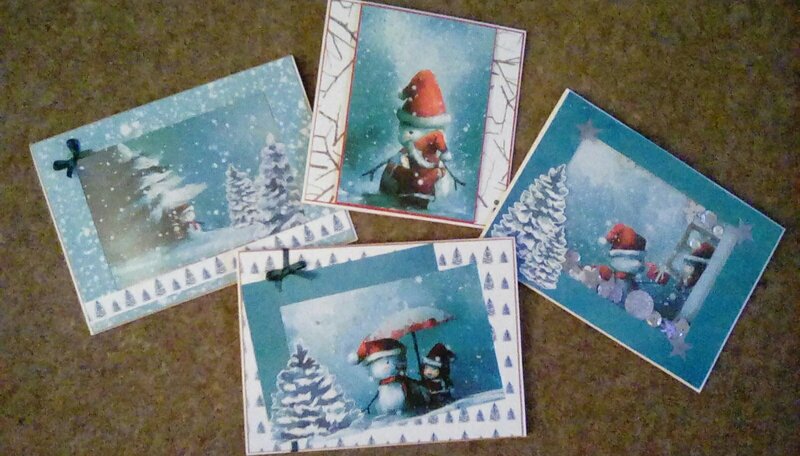 I have made four cards so far (busy and very fun afternoon of crafting, making the year’s first batch of mince pies and wrapping some presents whilst watching Christmas films), adding only acetate and craft stash basics. I’ve got 4 toppers left, and lots of background papers, and I’d love to another afternoon like today, but I am more likely to have time for one card here and there. 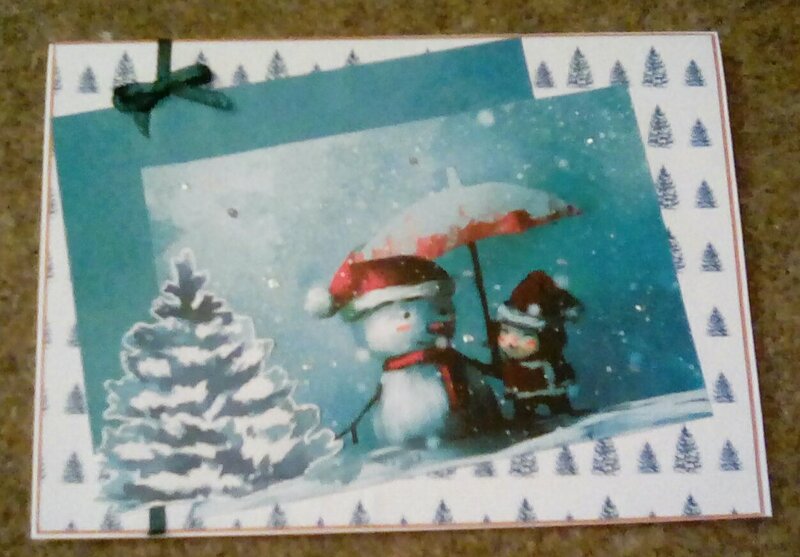 This entry was posted in cards, craft and tagged cardmaking, Christmas, Making Cards Magazine on December 5, 2016 by Isn't She Crafty. I think all crafters have a weakness, something they can’t leave a shop without. My mother in law has hundreds of ball of wool (and cats, a bad mix), my friend Sarah has sparkles in every shade and size you can imagine. For me it’s scrapbook paper, and ribbon. I have bought myself several Christmas presents, including new papers, and His Lordship has bought me at least one (bought by me, given to him with a ‘look what you got me. Don’t you have good taste’). I hate to use up a paper pad, but I love the creations I can make; oh for the money and space to buy two of each, one to play and one to keep. Anyway, I have decided to try to use some of my papers to make room. I thought I’d share the ways I use my collection. If anyone has any other ideas, or uses their papers for anything else interesting I’d love to hear about it. Scrapbooking. Probably the most obvious use, but I do this a lot. I love how I can show off my favourite papers this way, how I can use several papers on one page (the frugal crafter in me hollows the lower layers so as not to waste any paper). 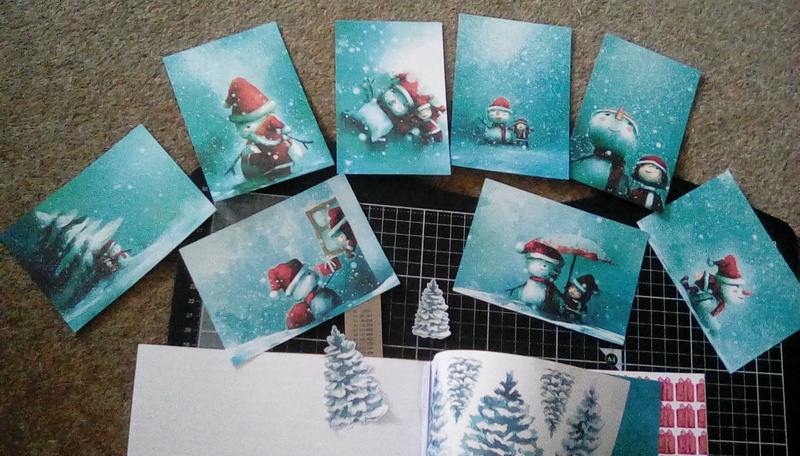 Cardmaking. Similar to scrapbooking, showcasing my favourites. The biggest difference for me between cards and scrapbooking iis that I embellish my scrapbooks much more, but I have fun playing with die cuts, toppers and stamped images with my paper collection with cards. Making embellishments. It’s easy to buy ready made toppers and decorations for papercraft projects, but I often want a different colour, or a different shape, plus I find it really therapeutic sitting and cutting out and sticking little bits to make embellishments (I tap my inner 5 year old). My Pinterest board inspiration: cards: embellishments has lots of ideas for making embellishments. Die cutting. I used to shy away from patterned papers for die cutting, but as I’ve become more confident I use small, tight patterns even with some quite intricate dies, but I tend to keep bigger images for less fancy design dies. I like to play; often I find it’s by using patterns that I see different ways to cut into my die cuts. Making decorations for Christmas and other events – snowflakes, 3d snowflakes, baubles (I’ve got some dies for this, but I make some without), 3d paper trees. Decoupage. There are so many decoupage kits to buy, but I get a real sense of pride from fussy cutting images from my collection and layering up a bit to add depth to my makes. Bunting. Bunting is still fashionable, and I can understand why: it’s a cheap way of dressing a room or a space and it’s so easy to change the feel. It can be as simple or elaborate as you want. I love that I can really show off my collection. I can also bring in my other craft addiction – ribbon. Making rosettes. These are fun, huge ones to use for party decorations, little ones as embellishments on cards, prizes for kids’ parties… I love that a little bit of glue and lots of folding can create something so wow looking in hardly any time. Making paper lanterns. I love that there are various types, from simple one sheet ones which I’ve made since I was tiny to ones with a template and lots of cutting and sticking. Paper beads. This is such a good way of using scraps. I love how each bead looks totally different. A child’s (or young at heart adult’s) mobile. Bookmarks. Yes, you can simply cut a rectangle and call it a bookmark, but I like to get a bit more creative and layer panel dies over papers, or make little origami book corners. Storage/presentation boxes. There’s so many possibilities with this, from simple folding to woven baskets. Paper lollies. I don’t know a different name for these, I cut circles and fold the edges up to make a triangle in the middle, then stick the folded bits to the next circle, gradually creating a globe. This entry was posted in craft and tagged craft; paper craft; on December 3, 2016 by Isn't She Crafty.